For other places with the same name, see Nowshahr (disambiguation). 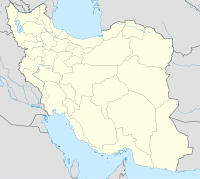 Nowshahr (Persian: نوشهر‎; also Romanized as Now Shahr, Noushahr, Noshahr, and Nau Shahr; also known as Bandar-e Noshahr) is a city and capital of Nowshahr County, Mazandaran Province, Iran. It is a port city, located on the southern coast of the Caspian Sea. With its humid, subtropical climate, sea bathing in the waters of the Caspian, and the natural environment of its mountains, Nowshahr has long been a destination for domestic tourism in Iran. It attracts visitors by the hundreds of thousands every year to its hotels and private villas, by virtue of its transport links with the other cities of Northern Iran. During the reign of Mohammad Reza Shah Pahlavi Nowshahr was known unofficially as the 'second capital' or 'summer capital' of Iran because it was the city in which the Shah and most high-level government officials chose to live and work during the summer months. Noshahr Airport, previously an army airbase and currently a civilian-only airport is located on the western part of the city. The city is also home to Imam Khomeini University for Naval Sciences, some branches and campuses of Azad University of Noshahr and Chaloos, and Royan Institute of Higher Education. The Dual-use port of Noshahr was built by a Dutch contracting firm in late 1920s and is one of the most active ports of Iran in the Caspian Sea. The city of Chaloos and its associated towns and villages were part of the Noshahr township prior to 1996 after which they formed the new township of Chaloos by legislation from the national parliament. The city has been slow to industrialize due to environmental considerations and having an already vibrant economy based on Tourism, Ship transport and Agriculture, nevertheless there are local Food processing, Timber Treatment and Steel industries. Recently, a trailer assembly plant has opened in cooperation with the MAZ of Belarus. Noshahr was home the Shamoushak who competed in the Persian Gulf Pro League from 2003 to 2006. Shamoushak folded its football team in 2013. ^ Nowshahr can be found at GEOnet Names Server, at this link, by opening the Advanced Search box, entering "-3077276" in the "Unique Feature Id" form, and clicking on "Search Database". ^ "Over $14m Invested in Nowshahr Port Since 2013". financialtribune.com. 2 May 2017. ^ "PMO - Nowshahr Port". noshahrport.pmo.ir. Ports & Maritime Organization (Iran). Retrieved 6 June 2017. Wikimedia Commons has media related to Nowshahr. This page was last edited on 4 September 2018, at 20:08 (UTC).